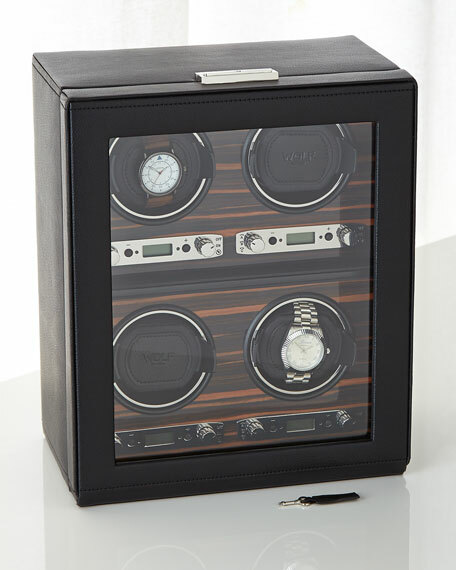 Wood case covered in pebble-textured polyurethane with Ebony Macassar wood veneer faceplate, shiny chrome hardware, glass lid, lock, and key. Patented rotation programs that include intermittent rotation with pause and sleep phases. Capable of completing between 300 and 1200 TPD in any direction (clockwise, counter clockwise or bidirectional). Lock-In cuff accommodates a wrist size in excess of 10". Runs exclusively on AC power; 3.3V (110/220V) adapter included. 10.75"W x 6.5"D x 13"T.